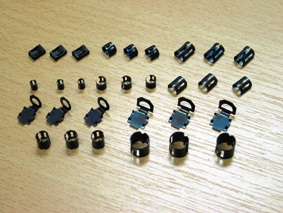 Home » Products » Electronic Components » LECTRA PRODUCTS CO.
With more than a half-century of experience, Lectra Products Company is clearly the preferred source for knob fasteners and other steel retainer springs used by automotive, electronic, and home appliance manufacturers. Our exclusive designs include Compression Rings, D-shaped retainer springs, U-nuts, J-nuts, flat springs and special locking knob fasteners. All are designed to permit simplified molding of plastic knob cavities and other components, and to facilitate the easy, rapid and accurate assembly of finished products.